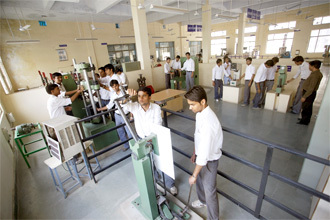 The Department of Mechanical Engineering was established under Rajiv Gandhi Technical University, Bhopal with the approval of AICTE.The Department of Mechanical engineering commenced its operations with an intake of 60 students which has now increased to 360. Since inception, a good number of laboratories were established. There were namely Basic Mechanical Engineering, Engineering Mechanics, Workshop,Engineering Drawing & Design comprising of modern equipment, apparates & machines. There after a few more laboratories were added like Fluid Mechanics, Thermal Engineering, Thoery of machines and Mechanics of material. It’s my honour to welcome you to the Mechanical Engineering Department and our great community of scholars. The discipline of Mechanical engineering has a long and distinguished history of innovative invention and technological breakthroughs that have tremendously benefitted the progress of man and society. One only needs to think of the inspiring early work of the Wright brothers to realize the enormous impact the invention of manned flight has had on humankind. This is, but only one of numerous examples of the productive ingenuity of engineers. Ever since the establishment of this institution, our primary goal for undergraduate students is to train future leaders with high-quality engineering education. The aim of department of Mechanical Engineering is to disseminate knowledge and technologies through quality teaching, research and its applications in Mechanical and allied disciplines. Our department has a team of qualified and experienced faculty and staff members and we are striving hard continuously to improve upon the quality of education and to maintain its position of leadership in engineering and technology.Our dedicated faculty graduated from world renowned universities grows our leading-edge research programs in dynamics, energy, thermo-fluids, design & manufacturing, and control etc. We strive to ensure that all our young students have a strong education with leadership, management and teaming skills, internship experience, and involvement in student activities. Our Laboratories have been very well established not only to cover complete syllabus but to motivate students to learn beyond the syllabus which definitely develops complete knowledge of the subject. Our department has been conducting seminar / conferences since its beginning to keep the faculty and students abreast with the latest developments in the field of technical education. Our Department has produced thousands of professionals and has established a name for itself in the country and abroad. They have consistently excelled in the highly competitive industrial environment, Best Employer/ awards in top-ranking companies. I attribute this success to the winning combination of a dedicated faculty that works hard at imparting quality education, a well-planned syllabus and last but not least, our students. I congratulate the team of faculty members and the students for their brilliant and innovative efforts. I wish all the students and faculty a great academic career. Upgrade or install new software in CAD/CAM Lab for learning and practicing. Upgrade the production laboretories/ Workshop with computer numerical control machines . Workshops & seminar are to be organized for better knowledge about latest technologies in Mechanical Engineering.